These are not your mama’s rubber duckies! 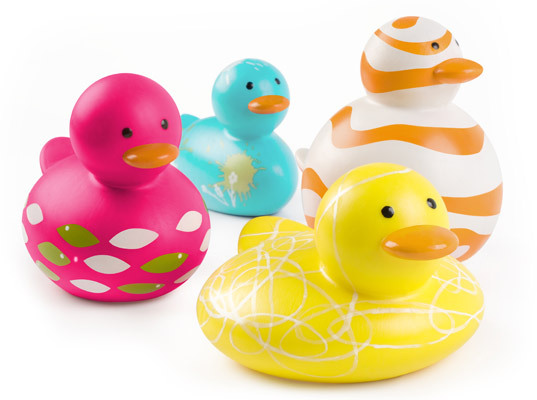 The Odd Ducks—Bob, Jane, Slim and Squish will enchant both you and your child with their hip, vibrant colors and unique designs. Best of all your little one can play with and even nibble on these Odd Ducks safely as the whole flock is 100% free of PVC, phthalates, and BPA. EcoLeeko Organic Terry Bath Buddy Hand Mittens are an awesome sustainable choice for bath time fun. Not your typical pastel puppet, these bold and bright washing mitts will appeal to a wide, color lovin’ range of little ones. Made of hand-dyed organic cotton French terrycloth, sewn with organic cotton thread and packaged in printed recycled paper sleeves, these pals are perfect to have on hand while getting your baby or toddler squeaky clean. Bath Time Learning Shapes feature creative themes that entertain little ones and teach them about numbers, letters, shapes and colors. Learning Shapes are made from a non-absorbent and non-toxic material that resists mold and mildew and sticks to the tub or shower wall when wet. These cool mod-colored shapes also float in the tub, and out of the tub the sets double as fun puzzles. 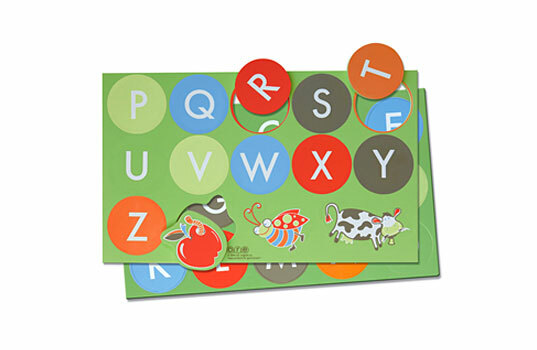 Bath Time Learning Shapes are 100% PVC-free and phthalate-free and come in four varieties – Numbers, Ahoy Matey!, Lady Bug and Alphabet. Make bath time fun time with super sweet organic cotton wash mitt critters from Under the Nile. They’ll entertain your tot while he’s in the tub or entice a reluctant bather into said tub. These washcloth hand puppets are Fair Trade and made from soft organic cotton and water-based dyes. Bonus: Your tot will love these puppets both in and out of the bath, making them an even better buy! Rub-a-dub-dub, No Suds in the Tub! There are thousands of baby bath time soaps, cleansers and other sudsy baby body products on the market and they’re all trying to convince parents that super duper clean is not only a good thing but a totally necessary thing. Yup folks, your baby is a terribly dirty mess! Or is he? Babies do have sweat glands but unless there’s a problem baby sweat shouldn’t smell bad. And babies aren’t spending their time fixing oily cars or other grimy activities. In fact, many baby experts note that parents are over-cleaning their little ones, which can be downright dangerous. Yes, dangerous. Antibacterial soaps, chemical fragrances and even sudsy bubbles can pose a health risk for your baby and these traditional baby care products aren’t eco-friendly. Instead, aim for warm water washes or use a biodegradable, eco-friendly cleanser for your tot. To learn more read our in-depth guide Rub-a-dub-dub, No Suds in the Tub, which covers everything you need to know about how to keep your baby clean and green without conventional soapy products. It’s no secret that breast milk is a hyper healthy food for your baby but did you know that there’s breast milk cheese on the menu at Klee Brasserie and that you can even make breast milk soap for bath time? Milk is actually an ideal ingredient for baby soap because it contains skin-healthy substances such as fats, vitamins, proteins and more. Plus, homemade breast milk soap won’t contain all that icky stuff you may find in conventional soap products. That said, there are still pros and cons of breast milk soap. Read our guide to Breast Milk Soap to learn all about them along with the safety considerations and how to make your own at home. 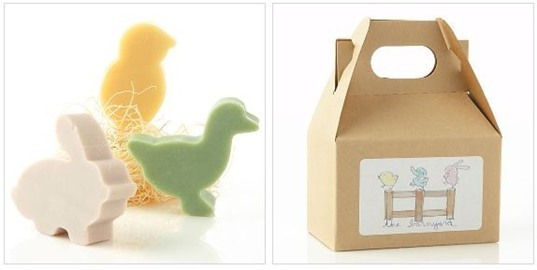 If you’re trying to keep bath time non-toxic why not keep it adorable at the same time with these cuter-than-cute little Barnyard Soaps. Each little farm animal–bunny, chick and duck–is handcrafted by the Saipua company. Saipua carefully crafts these olive oil-based soaps in small batches using food-grade vegetable oils, butters, herbs and extracts. Every bar is hand cut, air dried and cured in their workshop. Th barnyard soaps have a fresh mild scent, and all three come nestled sweetly in a bed of excelsior and packaged in a recycled barnyard box. 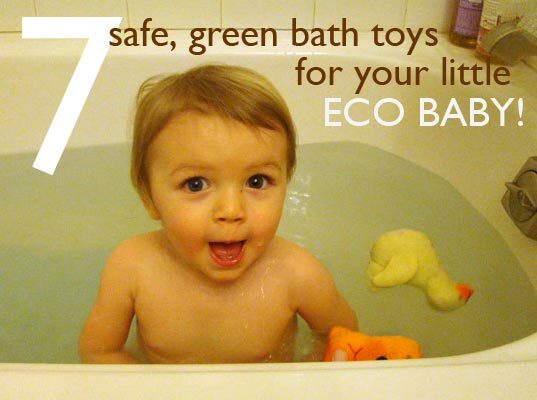 Eco Friendly Bath Toys For Your Eco Baby! These are not your mama's rubber duckies! The Odd Ducks—Bob, Jane, Slim and Squish will enchant both you and your child with their hip, vibrant colors and unique designs. Best of all your little one can play with and even nibble on these Odd Ducks safely as the whole flock is 100% free of PVC, phthalates, and BPA. EcoLeeko Organic Terry Bath Buddy Hand Mittens are an awesome sustainable choice for bath time fun. Not your typical pastel puppet, these bold and bright washing mitts will appeal to a wide, color lovin' range of little ones. Made of hand-dyed organic cotton French terrycloth, sewn with organic cotton thread and packaged in printed recycled paper sleeves, these pals are perfect to have on hand while getting your baby or toddler squeaky clean. Make bath time fun time with super sweet organic cotton wash mitt critters from Under the Nile. They'll entertain your tot while he's in the tub or entice a reluctant bather into said tub. 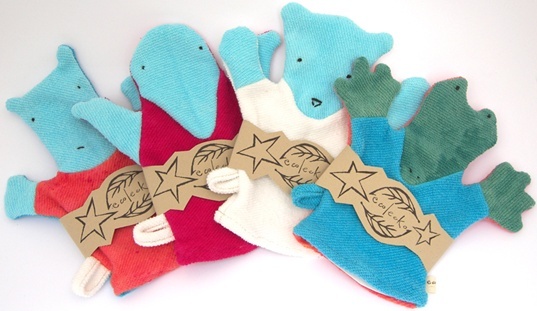 These washcloth hand puppets are Fair Trade and made from soft organic cotton and water-based dyes. Bonus: Your tot will love these puppets both in and out of the bath, making them an even better buy! There are thousands of baby bath time soaps, cleansers and other sudsy baby body products on the market and they're all trying to convince parents that super duper clean is not only a good thing but a totally necessary thing. Yup folks, your baby is a terribly dirty mess! Or is he? Babies do have sweat glands but unless there's a problem baby sweat shouldn't smell bad. And babies aren't spending their time fixing oily cars or other grimy activities. In fact, many baby experts note that parents are over-cleaning their little ones, which can be downright dangerous. Yes, dangerous. Antibacterial soaps, chemical fragrances and even sudsy bubbles can pose a health risk for your baby and these traditional baby care products aren't eco-friendly. If you're trying to keep bath time non-toxic why not keep it adorable at the same time with these cuter-than-cute little Barnyard Soaps. Each little farm animal--bunny, chick and duck--is handcrafted by the Saipua company. Saipua carefully crafts these olive oil-based soaps in small batches using food-grade vegetable oils, butters, herbs and extracts. Every bar is hand cut, air dried and cured in their workshop. Th barnyard soaps have a fresh mild scent, and all three come nestled sweetly in a bed of excelsior and packaged in a recycled barnyard box.